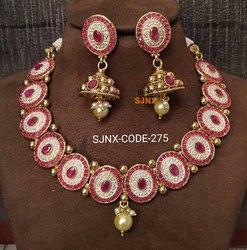 Pearl Kundan Necklace Set with Earing Set. Fashion Jewellery Beautiful Look.Traditional Look. pretty look jewellery for indian women jewellery. We are the leading and prominent Manufacturer and Supplier of Thewa Kundan Jewellery. High Quality Kundan Material.They wear it on different occasions.Pair of matching earrings compliments this set, making it perfect for party wear. 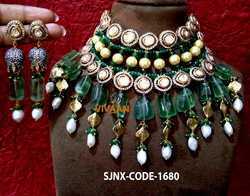 We are leading supplier of Traditional Kundan Necklace Set with drops. Note: Wholesaler customer will get discount. A perfect pick for a wedding,engagement,Party,Festive time or a traditional occasion which will surely compliment your look!Made From High Quality Kundan. Gives Very Rich And Elegant Look. Weddings And Other Auspicious Occasions. 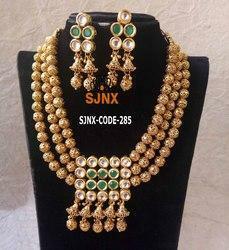 Traditional & Gold Plated Necklace set with Antique Earring, Pretty Look, antique Earring New Arrival Jewellery. We are leading supplier of Traditional Gold Plated Kundan Jewellery Set for Women, comes with the matching earrings. The look is stunning and precious, suitable for all kinds of dressy occasions. The Kundan used, is of high quality. Can be worn for engagement and wedding parties. Note: Wholesale rate will be different. 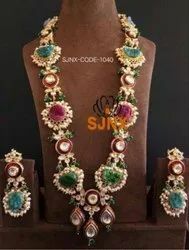 Excellent finish Great designs Pretty Look Unique Design .This fashion party wear necklace Jewellery set for girls and women is made of kundan which looks stylish and goes perfect with any attire. 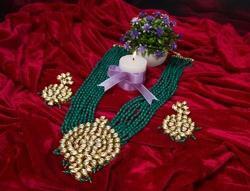 This jewellery set for women is perfectly suited for wedding or party wear. 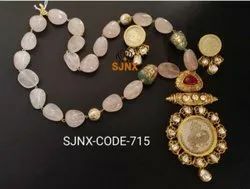 Designer Artificial Kuntan & Antique Design Necklace Set with Earings Indian Jewellery. party wear necklace,Excellent finish. Kundan Necklace Set .Preetty look White Stone And Pearl , A stylish and eye catching Necklace Set with Earrings made for the modern contemporary woman. 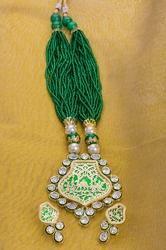 Traditional & Antique Design Pink, Green White Ruby Necklace With Jhumka Earring Set Jewellery. 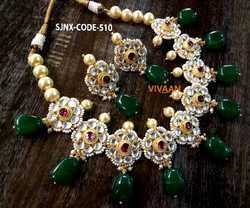 Gold Plated Kundan and Bead Necklace Set. 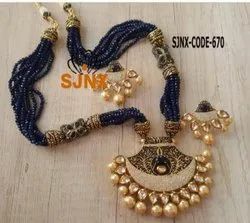 Traditional Ethnic Necklace Jewellery Set.This fashion party wear necklace Jewellery set for girls and women is made of kundan which looks stylish and goes perfect with any attire. 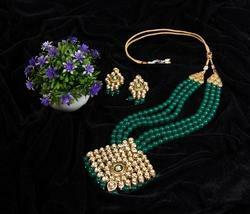 This jewellery set for women is perfectly suited for wedding or party wear. Preetty look ,Gorgeous Look, copper base material. A stylish and eye catching Necklace Set with Earrings made for the modern contemporary woman. This set with intricate thewa art designs gives a very sophisticated look when you adorn them! Necklace with adjustable back dori. Stylish Necklace Jewellery Set For Women. 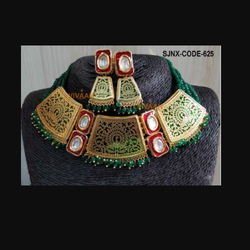 Get the Bollywood Look.Made from High Quality Handpicked KAUNDA, this party wear necklace set for women gives very Rich and Elegant Look.Perfect Ethnic wear for wedding and other festive occasions. Traditional & Royal Thewa Jewellery Golden Plated Necklaces Jewellery. Care Instructions: Remove your jewellery before washing, swimming or applying body care products. Store Jewellery in a safe pouch. Comes with the matching earrings. The look is stunning and preciously suitable for all kinds of dressy occasions. The kundan used are of high quality.Ethnic Wear. Can be worn for engagement and wedding parties. The kundan used are of high quality. Ethnic Wear. Can be worn for engagement and wedding parties. New Arrival Gold Plated Designer White Pearl & AD kundan Stone for bridal jewellery.Copper base material for women only. Traditional Thushi Necklace Set for Maharashtrian Wearing like Navwari Sari. Gorgeous Thushi Mala With Beautiful Earrings for Indian Traditional Women. Comes with the matching earrings. The look is stunning and preciously suitable for all kinds of dressy occasions. The kundan used are of high quality. Ethnic Wear. Can be worn for engagement and wedding parties.This set is light in weight.